REAL-ID database still lacks basic protections | Papers, Please! REAL-ID database still lacks basic protections – Papers, Please! We asked AAMVA’s Chief Privacy Officer about this in early 2016. Nothing was done. Members of the S2S/SPEXS governance committee were polled in 2017, and identified this as one of their two highest priorities. Still, another year later, nothing has been done. 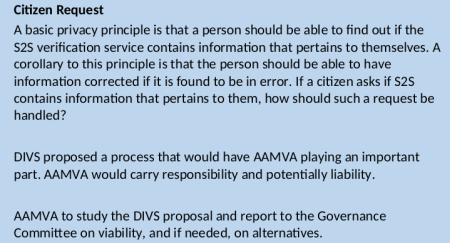 Apparently, AAMVA is reluctant to accept “responsibility and potentially liability” for the accuracy of the data it is maintaining and disseminating. As we have previously reported, these problems with SPEXS mirror those of the NCIC database of unverified arrest and criminal history data aggregated and maintained by the FBI, but for whose accuracy the FBI disclaims any responsibility. AAMVA and state DLAs are aware of the significance of this problem, but have done nothing to correct it. We’ve seen no evidence that AAMVA or the states have taken any action to address this, even as the number of records in SPEXS grows. AAMVA continues to try to suppress information about what data is contained in SPEXS, and how the system operates. But this table of fees assessed to states participating in S2S and SPEXS shows the numbers of drivers licenses for which data was included in SPEXS as of September 2017. The number of SPEXS records is much higher, since SPEXS also includes records for non-driver ID cards issued by participating states. New Mexico (NM) is the next state poised to benefit from the S2S functionality following Pennsylvania (PA). This will occur over the weekend of June 16th, 2018…. Following NM, Several states will be joining the S2S program in the upcoming months. The table below reflects these states and their planned implementation dates. Please note that states are encouraged to avoid these weekends for performing maintenance or deployment activities that require the Central Site to be available.